I made this page for the using a sketch at the stuckonusketches blog. I usually do 81/2 x 11 or smaller pages so I adapted it. This is a picture of my grandparents when they were first married. It is my favorite picture of them! Be sure to check out the tutorials below or you can click on tutorials under 'labels'. 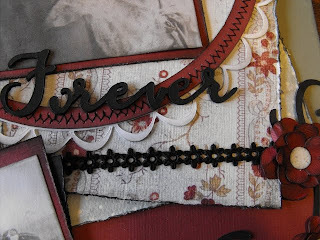 Scraping the edges of your paper gives it a roughed up edge and adds a little dimension to your paper project. 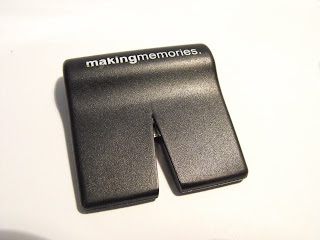 You can do this with a tool like the one pictured above, or you can use a slightly open pair of scissors. Just hold the tool and scrape it along the edge of the paper. (Experiment on scrap paper first) It is also fun to ink the edges after you are done scraping. Sometimes the paper rips a little, but that just adds character! 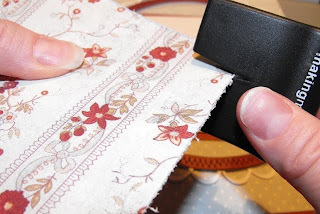 Sewing on paper is fun and adds a great touch to your scrapbook page or card! 1. Test on a scrap piece of paper first! 2. Back up over first few stitches to secure thread or use a piece of tape on the back. 3. Make sure you have enough thread on your bobbin to complete the project. 4. Your bobbin should have matching thread or 'invisible thread' since it will show through a bit. 5. 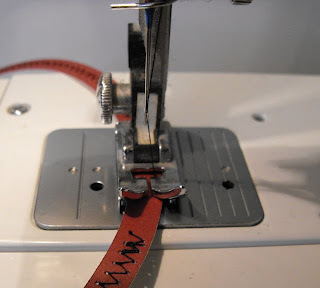 I sometimes have a hard time sewing straight lines, so I like to line up the center of my sewing foot where two paper lines meet. (See stitching on my Halloween layout) You can also line up the edge of your paper with the edge of the foot to keep a straight line. 7. 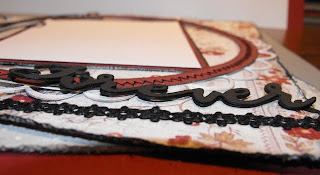 You can hide any mistakes or flaws under a cute embellishment! 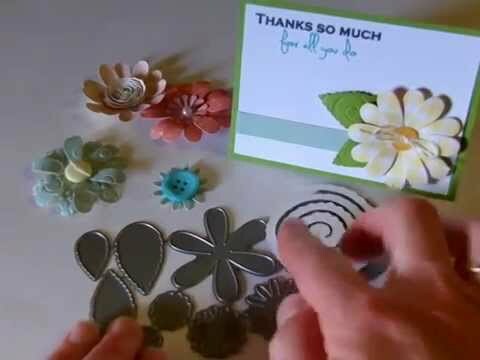 Making flowers with your cricut is fun and economical! Step 1: For each flower, cut out 3 flower pieces in various sizes. Crumple each flower piece. Step 2: Ink edges of each flower piece. Step 3: Layer flower pieces and glue together to make one flower. I really like chipboard, but it is expensive and I end up using a few of the letters and wasting the rest because I run out of the most used letters. 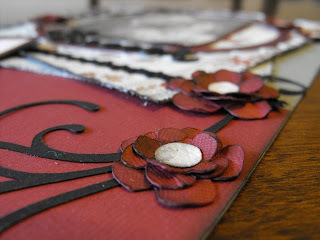 So, here is how to make faux chipboard! 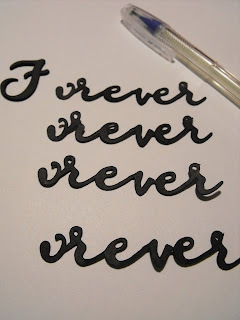 Step 1: Cut out the same letters or word 4 times on your cricut machine. 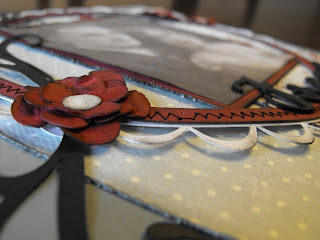 The end result looks great and you could cut the top layer in patterned paper for a different look. 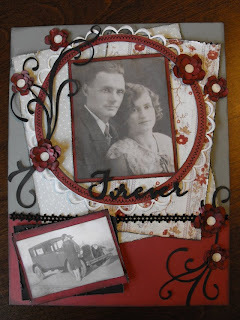 I used the Walk in my Garden, Home Decor and Home Accents cartridges on this page. I have instructions on how to make these flowers posted below or you can just click on the 'How To Techniques' under labels. Step 1: Using the Walk in my Garden cartridge, cut the daisy out at a variety of sizes. You will need two of each size. My cuts were all between 3" and 1/2"
I used walnut distress ink and swirly stamps to add pattern to my flowers. You could also use patterned paper. Step 2: Stamp each flower. 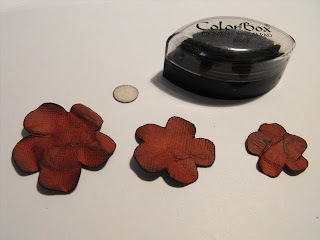 Step 3: Ink the edges of each flower with walnut ink. 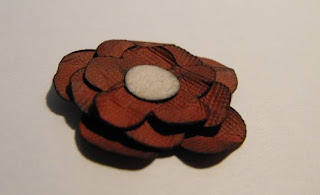 Step 4: Ink entire flower with antique linen. This ink is not waterproof, so this step just blends into the walnut ink and gives it a softer look. 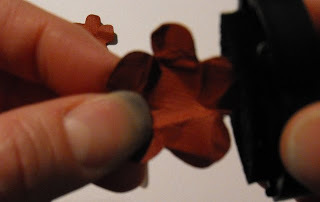 Step 5: Curl each petal around a needle or piercing tool. Step 6: Bend the ends of the petals around a pencil or handle of the piercing tool. This gives it a little extra dimension. This is how your flowers should look now. The circle is for the center. I used a circle punch and followed the above steps. Step 7: Layer your flowers together as shown in the picture. Step 8: Adhere center to flower. Your all done! 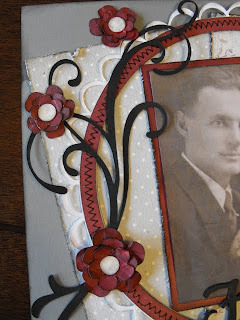 Now use them to embellish a card or scrapbook page. If this was helpful to you or if you have ideas for other techniques you would like to see, leave a comment! The flower is cut from the walk in my garden cartridge. Click on the How To Technique link at the right for a tutorial for making this flower. Step 1: Cut the cherry out twice at 3" (fits the 3" cupcake) from red and brown cardstock. This cut is on the cricut Home Decor cartridge. Step 2: Cut the stem off the red cherry. Step 3: Put the red cherry through your xyron sticker machine UPSIDE DOWN so that the adhesive is on the top. Step 4: Cover with red glitter. Step 5: Apply dimensional glaze around outside edges of cherry. Step 6: Fill in the center with dimensional glaze. Step 7: Let dry, then layer on top of brown cherry die cut. The inside of the card says "I hope your birthday is so good you can taste it!" I cut the cherry out of red cardstock, glittered and then covered with Ranger dimensional glaze. I embossed the cupcake 'frosting' by inking the edges and also stamping swirls with versamark ink, then heat embossing with clear embossing powder. This is a halloween card I made in 2008 using the Paper Doll Dress Ups cartridge. Non-traditional colors for a baby girl card. The flowers are punched from paper. The blue ribbon is BoBunny and I used the New Arrival cartridge. For this card I used the Walk in my Garden cartridge. I also sanded and inked the orange patterned paper. Cricut cartridges used: Sweethearts, paper doll dress ups and gypsy wanderings. Instructions for the cupcake box.